BALTIMORE — One of the most talked about musicals of the past decade opened Tuesday night at The Hippodrome. “Book of Mormon” is a comedy developed by the creators of the decidedly mature Comedy Central series “South Park,” Matt Stone and Trey Parker. The original “Book of Mormon” on Broadway won nine Tony Awards, including Best Musical. The traveling production is at the Hippodrome, chock full of songs we can’t play for you on Maryland’s first television station. “There’s no way in the world I could sing any bit of that, for you, on this show, not even close," said Jacques C. Smith, who plays Mafala Hatimbi in the show. "Oh my God, like the songs that I sing, it is not for the news,”. Hilarity ensues when Hatimbi’s village in Uganda is visited by Mormon missionaries - hilarity that is far from G-rated. Andy Huntington Jones plays one of the missionaries, Elder McKinley. But eventually, “Book of Mormon” is a story about the power of service to others, and of love. “I think it’s just worth the ride if you come to see it, and then ultimately, you’ll see that we’re trying to spread a message of goodwill,” Smith said. They also had good things to say about the old stage on the west side of Downtown Baltimore. 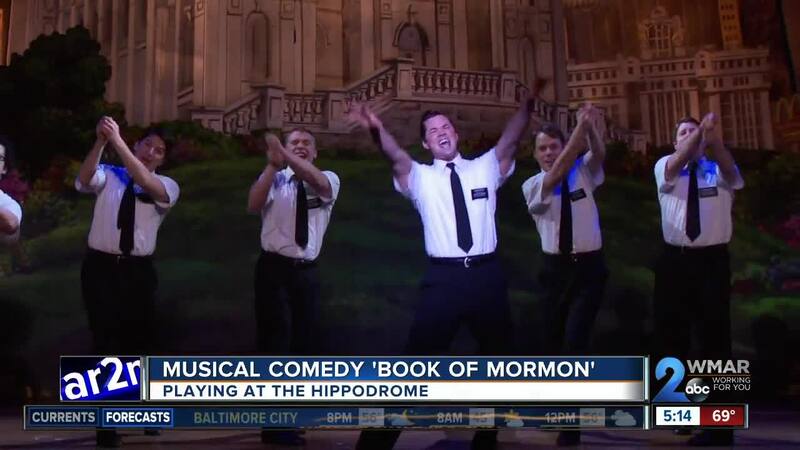 You can buy tickets for “Book of Mormon” at the box office or through Ticketmaster. But if you’re looking to save some money and you’re feeling lucky, they are using a raffle to sell a limited number of tickets for each show. You have to go to the Hippodrome box office, two-and-a-half hours before the performance, give them your name, and then a half-hour later they will draw names for a limited number of tickets. If you win you’ll be able to buy one or two tickets to Book of Mormon for $25 each.